Engraving might very well be my favorite printing technique of all time. Running my fingers over the raised letters, playing with the subtle glimmer of the ink as it hits the light, and the incredible contrast of engraving next to letterpress - really, how could printing be any more gorgeous? 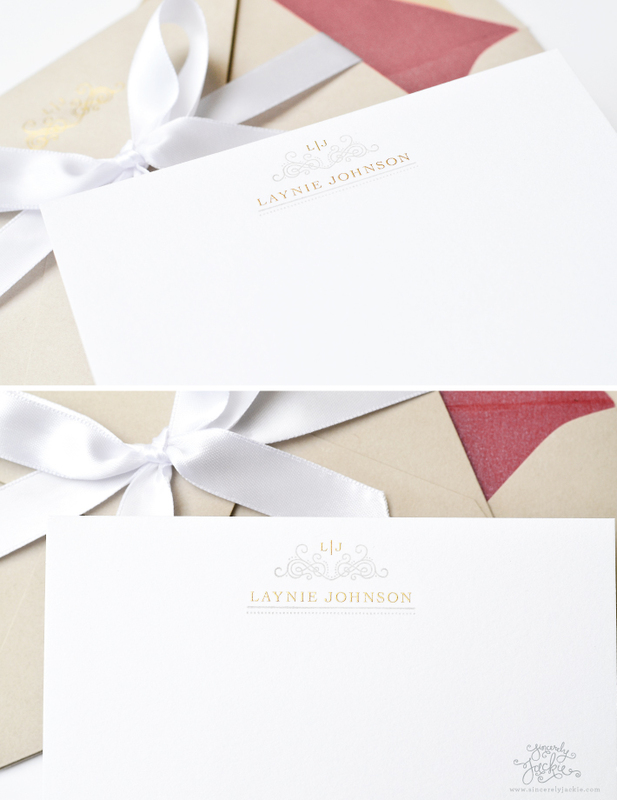 The most luxurious of all the fine print methods, Engraving is especially sought after by those looking to make a true impression with their invitations or stationery. I use gold engraving on my own business cards, and I love watching the reactions of people as they touch, feel, and experience my business cards. ""It's the most beautiful thing I've ever seen", the swoon, "what is it?" Engraving, like letterpress, is a fine print method where all of the printing is done by hand on antique press machinery. Also, similarly to letterpress, the print impressions are created by applying ink onto paper by pressing plate and paper together with a lot - as in several TONS - of pressure. Beyond these two similarities, letterpress and engraving have some very distinct differences. The most noticeable difference between letterpress and engraving is that engraving creates a luxuriously raised surface. The signature raised impression of engraving takes a higher level of skill and a longer amount of time to create, which is also why engraving is the most expensive of all fine print methods. To create the raised impression, engraving plates have the design etched (engraved) deep into the surface of a plate. The entire plate has ink applied to it, making sure to completely fill the recesses created by the etching. The inked plate is then wiped clean on the surface so that the only ink left is the ink within the recesses of the etching on the plate. Now that the plate has ink in the all the right places, several tons of pressure are applied to press the plate and paper together. The pressure ensures that the paper is pressed deep enough into the plate to create the raised textured of engraving, and to allow the ink to transfer to the paper. Since a thicker ink is used for engraving, the final print must also be run through an oven-type machine in order to dry and set the ink. Additionally, because the ink is not opaque, white ink can be engraved on a dark surface. 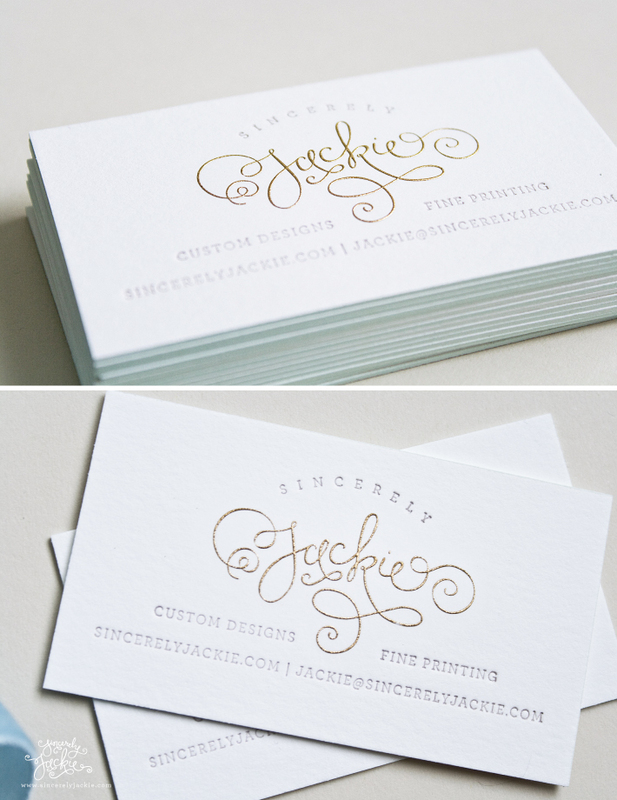 This is another wonderful aspect of engraving that is not possible with letterpress. I adore the way gold engraving truly looks like jewelry on paper. While foil stamping creates a highly reflective shine, engraving produces a rich gold that glimmers in the light the same way your favorite 24 karat gold bracelet does. It is absolutely divine in a timeless, traditional, luxurious way. Pairing engraving with letterpress is one of my personal favorite techniques for printing. 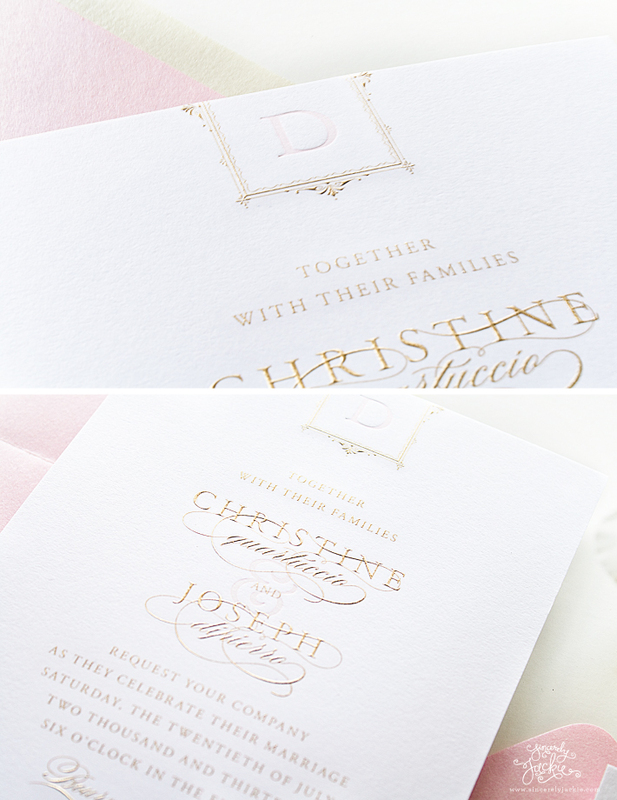 The contrast between the deep impression of letterpress and the raised texture of the engraving is a tactile dream, and a uniquely enchanting combination on wedding invitations. - You can print beautifully crisp white ink on a dark paper. Hello gorgeous. - Engraving does very well with fine details. Bring on the scrolls, monograms, scripts, and outlining. - Since it's so labor intensive, and involves so many steps during the print process, engraving tends to take about 1-2 weeks longer to create than letterpress or foil. - You can distinguish true engraving by the bruising (indent) on the backside of the printed piece. The bruising is created by the pressure and ink used during printing. If there is no bruising, the piece was most likely printed using thermography, which is a less costly version of raised printing. - Engraving inks are a touch more limited in color, although my favorites are gold, silver, rose gold, black, and white. - Keep in mind that engraving takes very skilled printers to create, and is fine printing at it's truest. Therefore, there are fewer printers capable of engraving, and even fewer that do it exquisitely. It is worth the investment to ensure you are working with a skilled engraver. I work with one of the most experienced engravers in the country, ensuring each piece is printed to perfection. So there you have it! 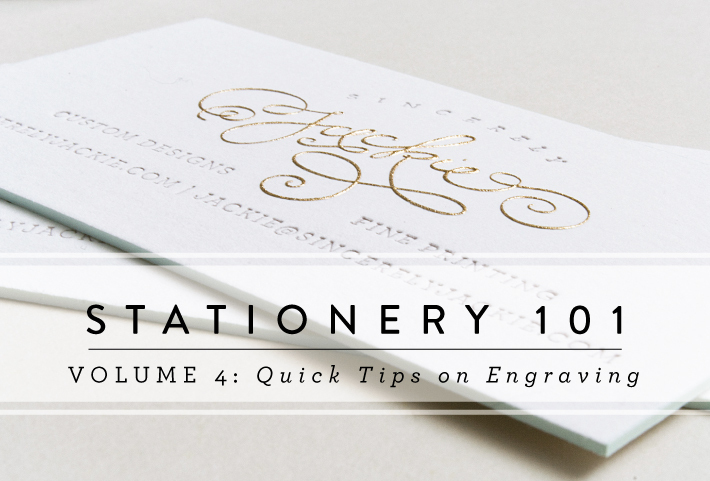 An overview of engraving and all the tips you need to know if you want to feature it in your invitations. Do you have any additional questions about engraving I would love to hear and answer them in the comments below. Tune in next Tuesday for Stationery 101: Foil Stamping, and don't forget to catch up on past Stationery 101 topics here.